Sister Park / Sister Reserve – Eco Alianza de Loreto | Loreto, B.C.S. Mexico’s National Commissioner of Protected Areas, Alejandro del Mazo Maza, as a representative of México to the International Union for Conservation of Nature (IUCN), participated in various events at IUCN’s quadrennial World Congress of Nature, to share the results of the collaboration of CONANP with institutions of Canada and the United States. The signing of four new partnerships were announced by the National Commissioner and his counterpart in the United States, National Park Service Director Jon Jarvis. The Sister Parks relationship between the Bay of Loreto National Park and the Channel Islands National Park, is one of the four new partnerships. The main objective of these alliances is the exchange of experiences for effective management of the Protected Natural Areas, including topics such as: monitoring, management, social involvement, and tourism, among others. The IUCN World Congress of Nature is held every four years and brings together leaders and decision-makers from 161 governments, over 1,000 NGOs, indigenous peoples, businesses, and academics, with the aim of uniting and prioritizing conservation efforts and promoting solutions to global challenges. Bay of Loreto National Park-Channel Islands National Park and the University of California Natural Reserve System. Working together, the two parks can expand their research, improve resource management, enhance public education and provide job training. The Sister Park / Sister Reserve Project will benefit the greater Loreto community by creating new economic opportunities, facilitate cultural exchange and expand education opportunities for residents. With extended outreach and eco-tourism programs the business network and social fabric of the community will be strengthened, benefiting present and future generations. “Discover Loreto with a Visiting Scientist” is a new educational program for the community that is one early result of exploring the Sister Park relationship. 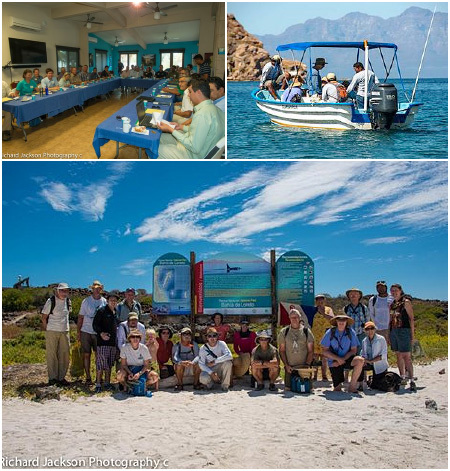 The program, sponsored by the Eco-Alianza Board, provides a unique forum to share ideas about sustainability – both of the marine resources and the economy of fishermen and eco-tour operators.